Author Ines Temple, CEO of the leading career transition organizations internationally, LHH Peru and LHH Chile, first published Usted S.A. (You, Incorporated) in Peru and it’s been a regular bestseller since 2012. Now her book is available in English, offering insider tips on how to stay employable in a world where job transitions are likely to happen multiple times throughout a person’s career. In the world of business, the reality oday is that companies merge or are acquired, they restructure and reorganize, and they face rapid market change and disruptive technology. This means that employees at all levels are unlikely to be in a company’s staffing plans for the long run. We all need to be ready at any time to become laid off. Because of this new reality, Temple advises taking the long view with our careers, defining for ourselves what gives us professional and personal satisfaction, and honing our skills so that we’re unvaryingly qualified and able to add value within our professions. Even when we’re employed, she instructs us to ensure we’re continually contributing to the bottom line. Today’s employees need to approach their positions as providers of professional services and to account for their achievements in a quantifiable way. Having an up-to-date list of the ways we add value will help in any performance review – or if we suddenly find that we need to sell ourselves to a new employer. 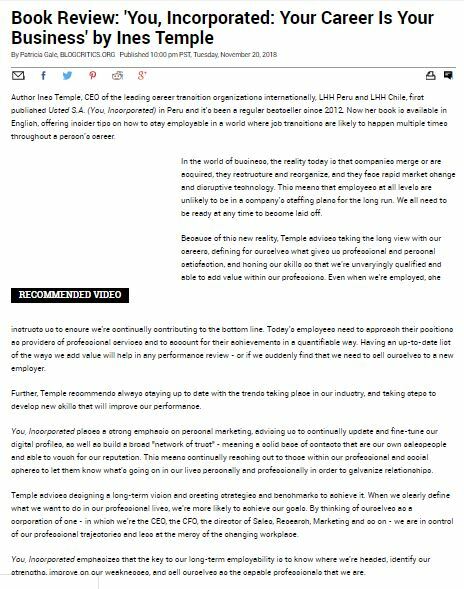 Further, Temple recommends always staying up to date with the trends taking place in our industry, and taking steps to develop new skills that will improve our performance. You, Incorporated places a strong emphasis on personal marketing, advising us to continually update and fine-tune our digital profiles, as well as build a broad “network of trust” – meaning a solid base of contacts that are our own salespeople and able to vouch for our reputation. This means continually reaching out to those within our professional and social spheres to let them know what’s going on in our lives personally and professionally in order to galvanize relationships. Temple advises designing a long-term vision and creating strategies and benchmarks to achieve it. When we clearly define what we want to do in our professional lives, we’re more likely to achieve our goals. By thinking of ourselves as a corporation of one – in which we’re the CEO, the CFO, the director of Sales, Research, Marketing and so on – we are in control of our professional trajectories and less at the mercy of the changing workplace. You, Incorporated emphasizes that the key to our long-term employability is to know where we’re headed, identify our strengths, improve on our weaknesses, and sell ourselves as the capable professionals that we are. 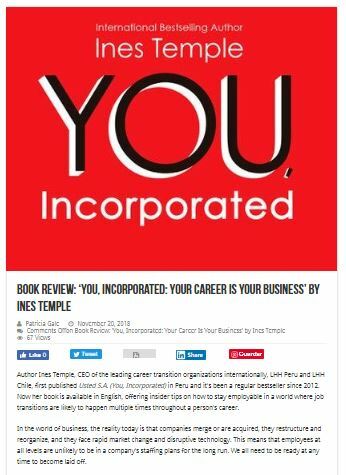 The post Book Review: ‘You, Incorporated: Your Career Is Your Business’ by Ines Temple appeared first on Blogcritics.